When it comes to a day-to-day commute there’s no better vehicle option than a midsize sedan. These vehicles offer the space you need without any bulk, while still providing you with optimal fuel economy. The 2018 Mazda6 is one of the most popular vehicles among the midsize sedan class thanks to its impressive engine options and knockout features. The 2018 Mazda6 is available in five athletic trims – Sport, Touring, Grand Touring, Grand Touring Reserve, and Signature – that will perfectly align to your lifestyle and driving habits. 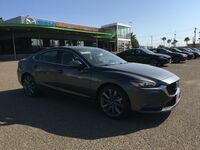 Bert Ogden Edinburg Mazda in Edinburg, TX offers a full lineup of Mazda6 options, giving everyone their perfect fit. Are you curious to know just how well this vehicle stacks up against the other midsize sedans on the market? Continue reading this 2018 Mazda6 vs 2018 Honda Accord comparison to find out. What are the differences between the 2018 Mazda6 and 2018 Honda Accord? Do you want a vehicle that will provide you with a fuel-efficient drive every time you get behind the wheel? The 2018 Mazda6 offers drivers an impressive EPA-estimated fuel economy of 26/35/29 (city/highway/combined) MPG thanks to the standard SKYACTIV®-G 2.5-liter DOHC 16-valve 4-cylinder engine with VVT and Cylinder Deactivation. Mazda6 drivers have the option of having a SKYACTIV®- Drive 6-Speed automatic transmission with Sport Mode in their vehicle or a SKYACTIV®-MT 6-speed overdrive. The competing 2018 Honda Accord, starting at $23,570, is powered by a 1.5T 4-cylinder engine with turbocharger paired with a trim-specific automatic or manual transmission option. The driver-centric cabin of the 2018 Mazda6 puts everything right at your fingertips. Steering wheel-mounted cruise controls and an eight-inch MAZDA CONNECT™ touchscreen makes controlling the features in your Mazda6 a breeze. The ultra-luxurious Signature Mazda6 trim level is built with top-of-the-line materials including Nappa leather seating surfaces, Sen wood accents, and UltraSuede® NU trim that lines the dashboard and doors. Other trims in the 2018 Mazda6 lineup feature cloth and leatherette sport seating surfaces to add to the athletic interior of this Mazda.